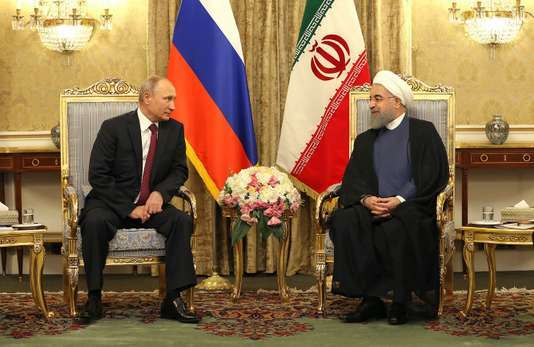 THE RUSSIA-IRAN ALLIANCE REINFORCES THE WORLD ANTI-IMPERIALIST FRONT. The world relations of forces lean towards confrontation and war between the different blocks opposing each other: the United States & its European allies, against Russia, China, N.Korea and Iran – a fact noted by as much by the pope as by the Ayatollah Khamenei himself. In Iran today, not everyone supports the official conciliatory, or neoliberal, tendency to privatise. It was during the first Rouhani government that this tendency used to have the strongest voice. During his first government (June 2013-June 2017) Hassan Rouhani facilitated many measures that allowed the penetration in Iran of North American enterprises and oil multinationals. Iran entered the World Trade Organisation which championed total privatisation. Rouhani’s Oil Minister Bijan Zangueneh reversed all the policies and measures of the revolutionary government of Ahmadinejad. This Minister arranged for all crude petrol to be exported and then reimported in refined forms. Khamenei had said at the time that, instead of this, Iran should stop depending on an oil economy, on the petrodollars and on the risks inherent to oil markets. That first Rouhani government allowed the ‘Garardad Khatalonbia” (GK) company to be crippled. This company, which belonged to the Guardians of the Revolution (Pasadarans), used to employ one million workers. It was forced to incorporate 350 private enterprises and to adopt a hybrid Pasdaran-military form of organisation. To put a stop to all crude being exported and its refined products reimported, the GK had started building the refinery of ‘Southern Star’. The plan was for Iran to produce its own gasoline for use and export. The Rouhani government reduced so much the government’s participation that GK is now only 20% of what it was intended to be. The refinery goes on being built, but the private sector controls most of it, sabotaging its construction, failing to capitalise for it and failing to invest in it. Although the refinery is nearly finished, it is completely paralysed. Be it in the wells or in other locations, incidents and explosions happen almost daily, stopping the concretisation of the “Southern Star” project. In Iraq, Massoud Barzani failed to maintain his position of president of the Iraqi Kurdistan region, after he lost his referendum for the independence of Iraqi Kurdistan. In Syria, Raqqa used to be the capital of Daesh (IS). This town was not ‘liberated’ but destroyed. It was destroyed by the North American bombardments after having allowed safe passage out for the Daesh’s bands. The latter used a corridor opened for them by the US and the Kurds, and regrouped in the North of Syria. This is how the US forces allied to some Kurds and anti-Assad Syrians emptied Raqqa of its inhabitants. One must give importance to the military agreements made by Qatar with Russia and Iran, to face up to the threats of Saudi Arabia and the Gulf Council countries (Emirates, Bahrain and Kuwait). 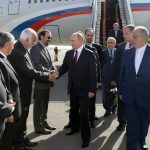 Ali Khamenei received Putin who came to Teheran to speed up a contract for the construction of a North-South railway presently held up by internal squabbles in Iran. There are also other important strategic contracts involved. Another railway network is in construction to link (North-South) the ex-USSR & Iran to the Gulf of Oman and Persian Gulf. Systems are now being put in place to overcome impediments dating back to the first Rouhani government. 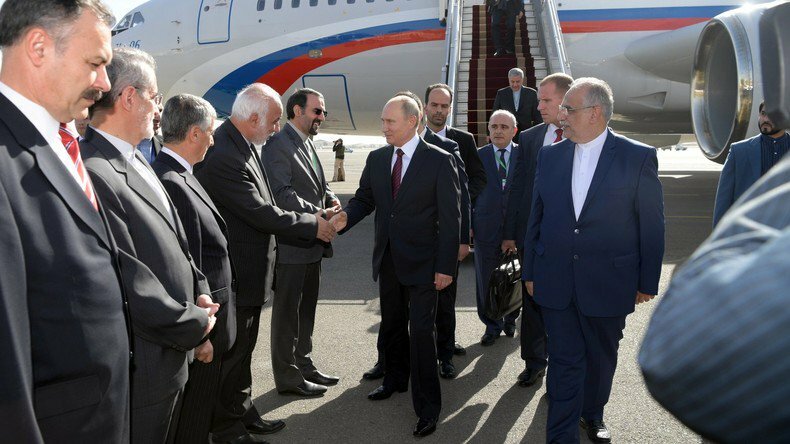 The fact that the president of Azerbaidjan Ilham Aliyev was present when Khamenei and Putin met, points to some change of heart on the part of this Nato country. The recent threats proffered by Donald Trump against Iran have kindled quite a revolutionary fire in Iran. Rouhani himself had to pronounce against Trump and the United States. This is the same Rouhani who made enormous concessions to the US; him who accepted the dismantlement of the Iranian nuclear installations and gave to the AIEA inspectors the right to permanent incursion and visit to sites. It is all to no avail however. Ali Khamenei said long ago that Iran was not going to build nuclear-headed missiles, as this runs counter to the humanitarian principles of Islam. The Earthquake happened in the night of 12 November. It added a new and dramatic dimension to the difficult situation already facing a population under sanctions and constant Western war threats. The seism was huge, 7.3 on the Richter scale. There are already more than 440 dead and 7,600 injured, whilst the destruction to some housing complexes and amenities is enormous. The right wing in Iran, and internationally, immediately indicted the previous governments of Ahmadinejad for the supposed flouting of building norms. In the hard-hit town of Kirmanshah (Iranian Kurdistan), Ahmadinejad had presided over the massive construction of social housing. The State had lent money cheaply to guarantee homes, particularly to the families of lesser means. At the time, the Iranian Minister for Housing and Transport, Abbas Ahmad Akhundi, had been a fierce opponent of the progressive government of Ahmadinedjad. Akhundi had insisted on house-building based on market principles. Now he is looking for someone to blame for the destruction, and he even manages to say that too many houses were built. If comparisons are made with previous earthquakes, they must be fair: In the 2002 earthquake at Bam, 23,000 people had died. In 1990, 36,000 died at Manjil-Rudbar with a Richter comparable to today. Now it comes to light that most of the houses that did not resist were in the private housing sectors, and not in the social housing ones. Ali Khamenei has forced the present [second Rouhani] government to set up a vast rescue operation. The army was mobilsed in a situation of intense cold, with planes and helicopters. The Pasdaran and the Red Cross were involved. Now, militias and social organisations visit the most remote villages. Everywhere there are volunteers, people giving blood. The physical injuries are enormous and painful, but the level of collaboration and social organisation of the masses is very moving. Hassan Rouhani was elected for the first time in 2013, after Ahmadinejad was replaced. Rouhani’s first government was from 2013 until May-June 2017, when he was re-elected and started his second mandate. Ali Khamenei, in office since 1989. The crude oil produced in Iran is generally refined abroad where it is turned into naphtha, gasoline, diesel fuel, heating oils, kerosene, liquefied gas and other products – which Iran then re-imports. The private sector has a vested interest in having the crude exported and then re-imported in the form of refined products. http://www.independent.co.uk/news/world/americas/us-politics/trump-iran-un-speech-murderous-regime-saudi-arabia-latest-a7955641.html, Trump called Iran a “murderous regime” on 19.9.2017.